Starlings is a collection of short stories, with some poems and a play, along with an introduction by me, all issued conveniently in one volume by Tachyon Press. It’s coming out in February 2018. “An intimate first flight of short fiction from award-winning novelist Jo Walton (Among Others, The King’s Peace). An strange Eritrean coin travels from lovers to thieves, gathering stories before meeting its match. Google becomes sentient and proceeds toward an existential crisis. An idealistic dancer on a generation ship makes an impassioned plea for creativity and survival. Three Irish siblings embark on an unlikely quest, stealing enchanted items via bad poetry, trickery, and an assist from the Queen of Cats. “Multiple award-winning science fiction and fantasy author Jo Walton’s first short fiction collection is a captivating array of fairy tales, mythology, space fiction, machine sentience, alien encounters, heaven, and more. the collection offers an incredible sense of intimacy. It’s the closest we’ll come to understanding how Jo Walton’s dizzying writer’s mind ticks along, and and how her imagination flows. It’s a rare opportunity, to peek in on the inventor in her workshop. 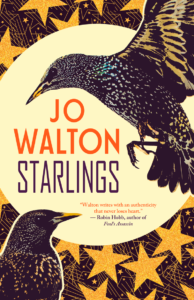 Starlings is revelatory not only as a collection of fiction, but as a sort of biography of the process of writing itself. Fascinating. 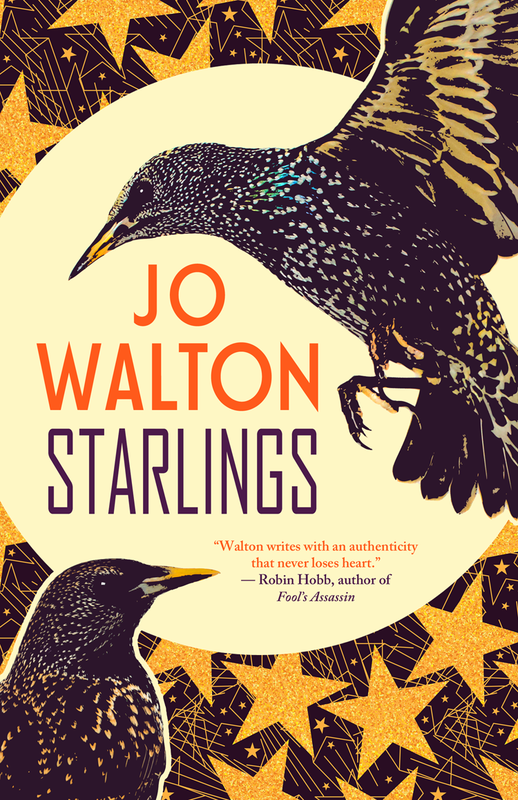 Walton’s right in saying that Starlings isn’t really a short-story collection. It’s something better: a written showreel, illustrating yet again that her imagination stretches to the stars (or the starlings), and that she’s endlessly inventive in finding new methods to express it.